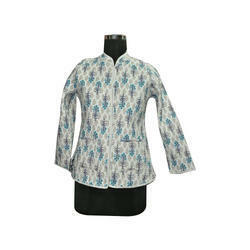 We offer an extensive range of Women Printed Cotton Jacket to our customers. These are developed using the premium quality material and advanced technology. The finest Cotton Printed Quilted Jacket are made available by us in the market, at the most reasonable rate possible. Making of this range done as per the set industry norms and guidelines, its standard of quality never diminishes. Further, its superior finishing, elegance and ability to lock heat, is widely praised. 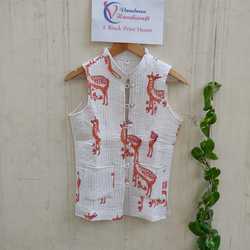 Banking on our enriched industry experience, we are able to supply Women Hand Block Printed Summer Cotton Jacket. Matching with the requirements of the clients, we are offering a quality approved array of Cotton Printed Jakcet. The Cotton Printed Jacket we offer is widely demanded amongst the clients for its availability in various sizes and patterns. These products are available in sleeveless pattern. We are working with the team of skilled designers, engaged in designing an exclusive collection of Flower Print Cotton Jacket. Our Flower Print Cotton Jacket is available in various prints. Offered products are widely demanded for their beautiful prints that provide astonishing appearance to the wearer. Hand Block Print Cotton jacket. Double sided reversible use. All design Hand Block Print. Pockets available.